Bernard Gray Hall Bed and Breakfast has been a successful bed and breakfast for since 1989, hosting both repeat and new guests. 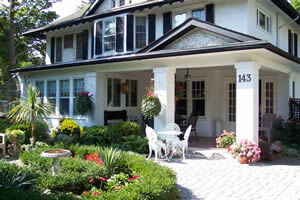 This c1900 doctor's house has all the charm and character of old town Niagara-on-the-Lake. One block from the main street and an easy stroll to all Shaw Festival theatres, shops, and restaurants. Our guest parlour has a reading library, TV, and fireplace. Our large suites King-size beds or XL twins and sitting areas ideal for multiple night stays. All our rooms have private ensuite washrooms. Each morning we serve a full hot traditional breakfast in our dining room. Breakfasts are varied each morning and can accommodate special diets. Dowtown location. Full hot breakfast varied daily. Guest may choose from a variety of breakfast selections. We will accommodate on request special breakfast requirements for diet or allergies.